This entry was posted in Food, Herbs & Spices, Recipes, Uncategorized, Vegan, Vegetarianism and tagged Food, Recipes, Vegan, Vegetarian. Bookmark the permalink. ME TOO! I will now add Flax. For the football game Sunday night it is what I am having GO PATS!!!! Have a great football night Eunice! Thanks he is going for his 6th ring but I could do without a heart attack 🙂 from his come from behind wins going to ask for a blowout! These sound delicious. Thanks for the recipe. Looks like a great recipe! Thanks for sharing. You’re welcome, and thanks for visiting! 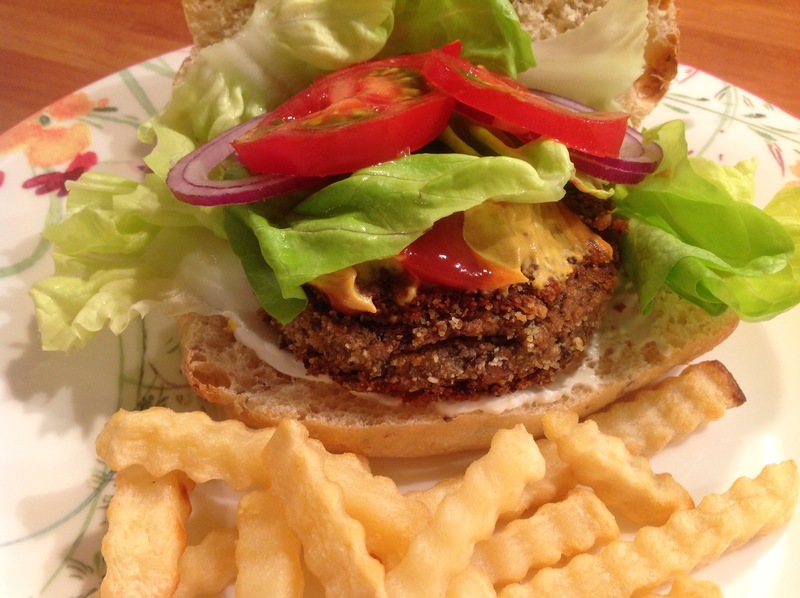 Fab vegan burger! Love how easy the recipe comes together. A flavor packed dinner in 30 minutes is always a winning recipe. 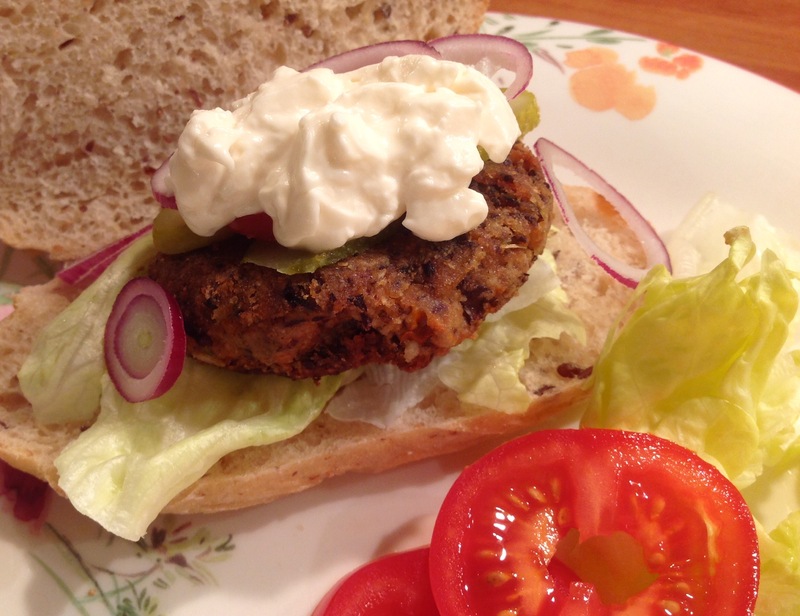 I love a good black bean burger but I haven’t made them myself! I don’t think this recipe could be any easier, AND I have all the ingredients on-hand! Thank you! Yum! Cathy, thank you very much for the recipe. Too easy! It looks very appetizing. On Saturday morning I buy all the ingredients and that will be my lunch with a good salad. I’ll tell you how I get it, because I’m a mess cooking except with vegetables. Greetings from Margarita. Cathy the hamburgers did not come out round, but they were delicious! The first dough I made had to throw it out because it came out hard as a stone. But the second I got it. Do not cook, but your recipe has already taken the quiet: “Cathy burgers with a touch of Margarita that does not know how to make round” 🙂 🙂 Take care. Greetings from Margarita. So brave of you to try Margarita! They say practice makes perfect… 😉 Happy cooking! Agree with Debra and Eliza, will try! Thanks. I’m getting hungry. All the toppings you mentioned are fine, along with some sauteed onions. I’ve been buying a frozen version to fall back on when we’re in a hurry for a meal, but your version sounds delicious. Must try. Thanks Cathy! It is really quick Susie, and with no hidden ingredients like the shop-bought ones! 😉 I have never seen them in the shops here, so when I saw a tin of black beans (also hard to find) I knew I had to try making them! guess I have ready too many posts so I could not leave a like. I know what you mean! I just try and eat what tastes good in small quantities… not easy though! LOL! I’ll take your word for it. Have you ever had refried black beans? YUM! I’m going to try this recipe out this week! Thanks so much for sharing! I’ll give it a go as gluten and dairy free too! Looks delicioys!